Followers of my blog will know I write about Vegan food because a) I have not eaten meat for 18 years b) I am unable to eat milk and eggs. I personally get a little tired of the argument that a Vegetarian/Vegan lifestyle is a choice and when you have allergies it's a lifestyle forced upon us. I can not argue with the fact, it is true but as someone who sits on both sides of the fence, I am saddened that my Vegetarian lifestyle should be regarded as less important than any other diet on the planet. If someone attacks my right to not eat meat, I take it personally, it’s insulting. For the record, I don’t give a c**p if you eat meat just don’t shove it in my face and we will get along just fine. I live with a meat eater and I do not expect them to stop eating burgers because of my personal beliefs. In the same way, I do not ban them from eating dairy products, you will find Ben & Jerry's in my freezer. If my allergies disappeared tomorrow, I would still follow a Vegetarian diet. I would not go back to dairy or eggs as I think farming practices are cruel. I want to address something which often becomes a hot topic within the Allergy/Intolerant community on Twitter. 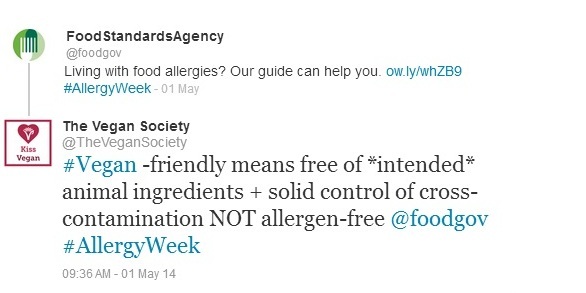 On the whole, a product carrying the Vegan Society logo will be suitable for my needs but I would not recommend for those who experience life threatening allergies. That would be foolish on my part. I've got plenty of years experience under my belt to understand we can't cater to everybody. The problem is Vegan food manufacturers can often face the same issues as those making dedicated Free From Food. Products can be made in factories which handle food allergens. You will often see Vegan food labelled "may contain dairy" or similar warnings. Some will argue how can a product be certified Vegan if it contains trace of milk but I will also point out the same occurs with Free From products. I have eaten products labelled dairy free but they may contain milk. You could argue this one until the cows come home but in the case of Vegan products, it is a question I have asked The Vegan Society but to date I have not had a reply. I believe decisions should be made on individual ethics. I guess some Vegans will be strict, others may allow for possible traces and of course these products will still appeal to Vegetarians. I think people forget it's not all about what we are avoiding to eat, the heart of any Vegetarian or Vegan argument centres on animal cruelty. I believe that Vegan and Free From Food can co-exist, as in my own diet, but I would not automatically assume a Vegan product to be safe for my allergies/intolerances. No one should ever assume something is safe for them; you should double, hell no, triple check the labels. Ah! You've been thinking a lot about it too - I'm drafting a blog on this as well! I'll just point out that products aren't 'certified' vegan - they're 'registered' by the Vegan Society, and I've been in touch with their media representative this week, so will blog in length about what they had to say tomorrow or Tuesday. It's interesting, but quite lengthy, so still working on editing it! Will add a link to this post. It was probably more rambling than thinking but the topic does play on my mind. Thanks for the heads up re: registering a product, you taught me something there so I look forward to reading your blog post.